Have you been lucky enough to come upon a rosebay rhododendron on the Buckhorn Inn Nature Trail while it is in full bloom? You can see several beautiful specimens toward Cottage 1 and also growing along the edge of Buckhorn Pond. They reach their blooming peak in June. 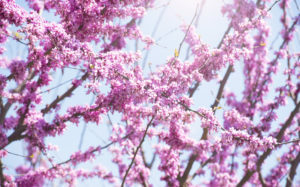 The Spring 2018 issue of Smokies Life Magazine http://www.smokiesinformation.org/smokies-life-magazine celebrates this beautiful shrub. There are four native species of this wonderful plant in this area. Rhododendron are seen along many trails in the Great Smoky Mountains National Park. The rosebay grows at lower levels and can be found throughout the Great Smoky Mountains National Park. The small-leafed variety also grows at lower levels. The Carolina and the Catawba can me found at mid- to high-levels. 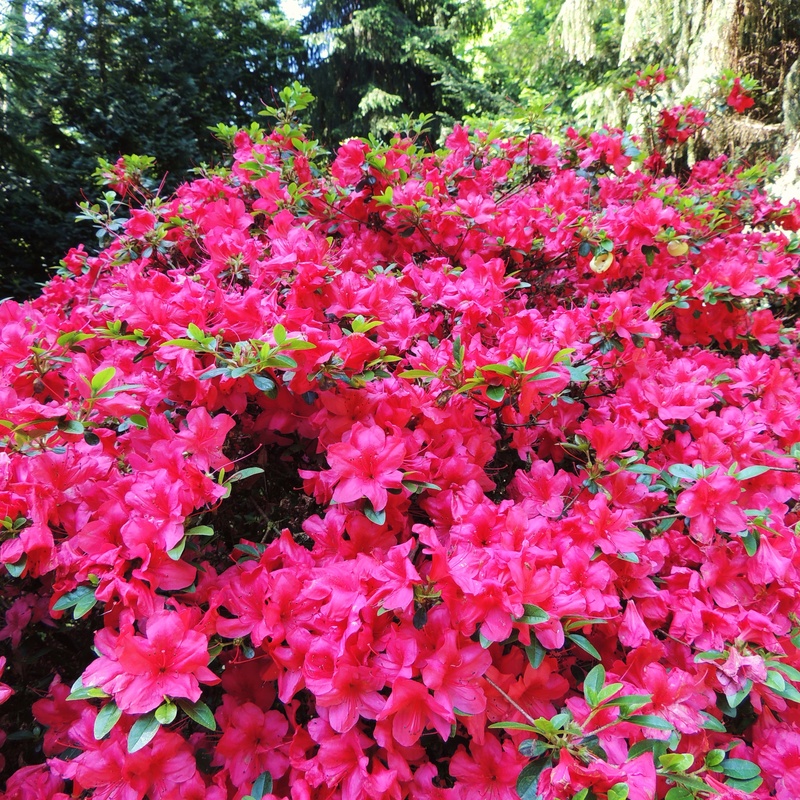 The word “rhododendron” means rose tree. The Smokies Life article by Courtney Nix contains this marvelous description, written in 1799 by explorer John Fraser, Jr.: “We had been traveling among the mountains, and one morning we were ascending to the summit of Bald Mountain in the midst of a fog so dense that we could not see farther than a yard before us. As we reached the top the fog began to clear away, and the sun to shine out brightly. The first objects that attracted our eye, growing among the long grass was rhododendron catawbiense in full bloom. There was no other plant there but itself and the grass, and the scene was beautiful.” Indeed, it must have been spectacular! These evergreen bushes prefer moist, acidic soil. They do well in light shade. High winds can harm the plants, so be sure they are planted near wind-breaks. Pine needles are good used as a mulch as they add acid to the soil and keep the ground moist. Rosebays, such as ours, do not bloom every year. They have an irregular bloom cycle. Some years, perhaps due to good weather, lack of a late frost, or good patterns of rainfall, more shrubs than usual bloom. Count yourself lucky if you happen to be in the Great Smoky Mountains during one of these “Big Bloom” years! 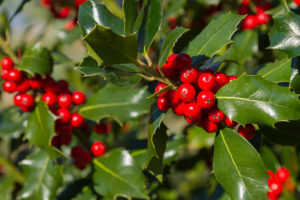 Have you admired the holly bushes on the Buckhorn Inn Nature Trail? We have two American specimens of this beautiful evergreen. Many different types of birds feed on bitter holly berries. The thick, spiny leaves provide color in the landscape year round. And wildlife, including many different bird species, feed on the bright red berries. Interestingly, the berries are hard and inedible during the fall and early winter months. It takes several frosts, or freezes, for the fruit to become softer. To the ancient Druids, the leaves offered protection against evil spirts. In those days holly was often worn, sometimes as a wreath around the head. It was viewed as being a sacred plant because it remained green all winter. In some traditions of Wicca, the Holly King is one of the faces of the Sun God. He was born at midsummer and rules from the autumnal equinox to the vernal equinox. In the Christian faith, the sharp leaves harken to the crown of thorns worn by Jesus and the red berries symbolize drops of his blood. The evergreen is often used in decorations for the Chinese New Year. You can cut your own branches to fashion wreaths and centerpieces. 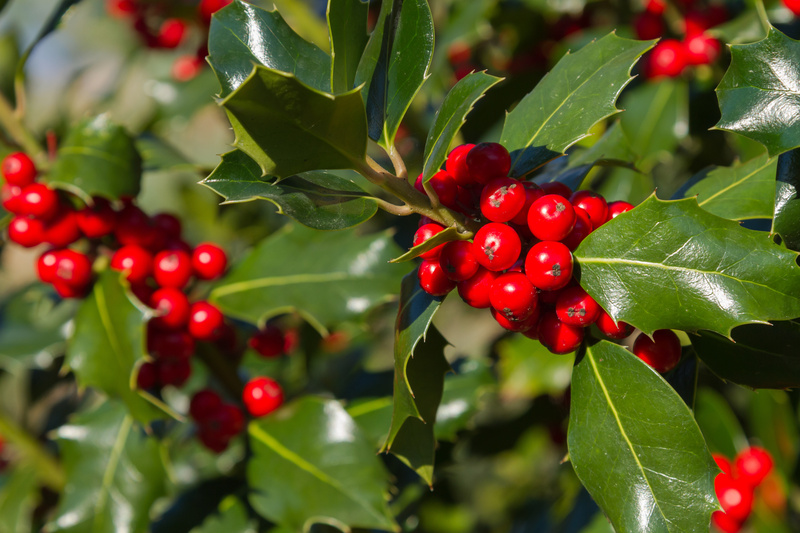 Just be sure to wear protective gloves when working with holly–the leaves are sharp! 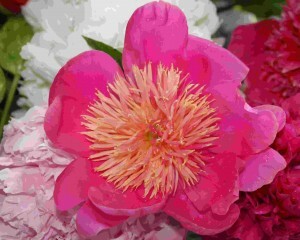 Peonies are my favorite cultivated flower. And thanks to Buckhorn Inn regulars Kitty and Neil Taylor who suggested them we have several beautiful varieties–all in bloom right now. Photograph courtesy of Buckhorn Inn regulars Billie Bethel and Walter Sina.